This spring in the United States has been the warmest on record, that’s since record–keeping began in 1895, the U.S. National Oceanic and Atmospheric Administration (NOAA) has reported. Temperatures for the past 12 months, and for year-to-date, have also been the warmest on record for the contiguous U.S.
31 states reported record warm temperatures for spring, and 11 had temperatures within their 10 warmest on record. 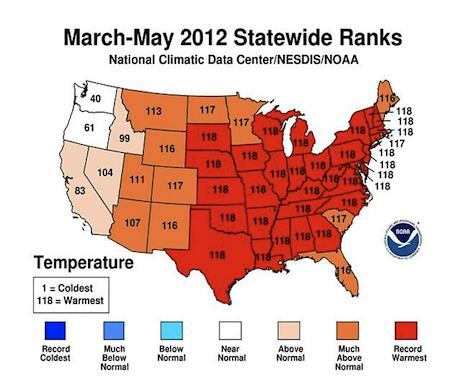 The eastern two-thirds of the U.S. was the warmest area of the nation during spring. The average temperature for the contiguous United States during May was 64.3°F. This was 3.3°F above the long-term average and made it the second warmest May on record. Deke Arndt from the NOAA Climate Data Center has said that this kind of warmth is an example of what we should expect to see more often in a warming world. We should expect to experience more long–lasting heat waves, more record high temperatures during the day, and more record high overnight lows. Additionally, drought conditions combined with wind made for dangerous wildfire conditions in the Southwest of the country. Consequently, the Whitewater–Baldy Fire in the Gila National Forest of New Mexico burnt over 210,000 acres by the beginning of June. It broke the record for the largest wildfire on record for the state, previously held by the Las Conchas Fire of 2011. Clearly, as well as warmer temperatures across the U.S., wildfires are starting to burn massive areas.